Hemlock is the common name of the Tsuga, a member of the pine family and conifer genus. When the tree’s leaves are crushed, they smell like the poison hemlock plant (the plant that killed Socrates). However, unlike the plant, the tree is not poisonous. Hemlocks thrive where there is moisture and cool temperatures, including areas with snow. They are considered medium-size trees, and can grow to almost 200 ft. in height. The bark of the tree, which has a scaly appearance with deep furrows, ranges in color from a dark, charcoal grey to reddish brown. The hemlock’s wood is made into pulp, and its bark is used for tanning leather. Tea can be made from the tree’s needles. 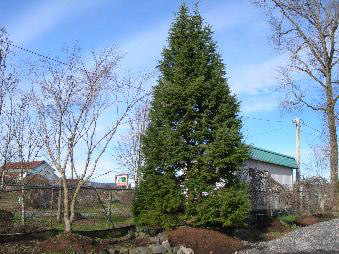 Hemlocks are also used in landscaping and gardens. There are several species of hemlock trees, four of which can be found in North America. The Pacific Northwest is home to two types of hemlock, the mountain Hemlock (Tsuga metensiana) and the Western Hemlock (Tsuga heterophylla). The mountain hemlock, also called the black hemlock and hemlock spruce, is an evergreen coniferous tree that mostly grows at high altitudes. It is a small, slender tree with beautifully layered branches that can grow tall as well as low and sprawling like a shrub. The mountain hemlock can be found in Canada, British Columbia, Alaska, Washington, Oregon, California, Idaho and Montana. The crown of the mountain hemlock is slender with a cone shape. It has needle-like leaves that are blue-green in color, as well as small cones that can grow from 1 to 3 inches in length. Mountain hemlocks mature slowly with a lifespan that can exceed 800 years. They need sufficient water and prefer loose, well-drained soils. Although the mountain hemlock grows best in forested areas and on sheltered slopes, it can also be used as an ornamental tree. Mountain hemlocks can even be grown in containers. The Western Hemlock, the state tree of Washington, is the largest species of hemlock. It has grayish-brown bark with moderate furrows. Like the mountain hemlock, it can be found in Canada, British Columbia, Alaska, Washington, Oregon, California, Idaho and Montana, usually in forests and coastal ranges at low altitudes. Western hemlocks can live for more than 1200 years and can grow up to 230 feet tall. The Western hemlock’s crown has a broad, cone shape with needle-like leaves and cones. New growth droops at the top of the tree. The tree’s needles, which are almost flat, are yellow to green in color on top, and white on the bottom. The cones turn from a green and reddish purple to brown as they grow. The cambium (tissue) of the tree is edible. Similar to the mountain hemlock, the Western hemlock’s bark is used for tanning. The tree’s needles can be chewed or used for tea. Indigenous populations also used the tree’s wood for carving. If you are considering adding a hemlock tree to your landscape, consult a big tree specialist. An expert in big trees like the hemlock can help you chose the right type and shape of tree for your property, and advise on the tree installation.